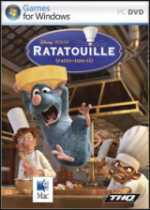 Ratatouille offers a fresh and exciting take on the platform action genre. The game will engage players in deep, fluid, and fast gameplay through fun filled mini-games, daring heists, frenzied pursuits and wild chases. This game will provide constant fun and challenge based on the Pixar animated movie. Players will take on the role of Remy, a young rat whose love for food puts him at odds with his family's needs. Relive some of the film's most memorable moments and take part in a series of unique mini-games, cooking challenges and head-to-head multiplayer games. There's numerous enemy characters (knife wielding chefs and poisonous insects) and a wide variety of missions (navigating pathways, collecting cheese and searching for recipe cards). Navigate through environmental hazards and solve puzzles. It uses licensed voice over talent and movie snippets from the movie. There's over 30 original mission objectives filled with moving obstacles and vicious enemies.